Brexit will happen! I was honestly worried that pro-EU forces would--as they have before--reverse voter sentiment somehow to preserve the proto-empire. The next "European" tank will be a German Leopard II tank chassis with a French LeClerc tank turret. So I guess the French and Germans could swap tanks they have in storage with each other to build "new" tanks. For a moment there, I was impressed that the Europeans had designed a "new" tank. I hope it is true that the European Union wants their military efforts to be complementary to a strong NATO--and not to a NATO that starved of troops and money by the Europeans who are also in the EU. I really resent that Democrats distorted and politicized our inadequate border control capabilities to make America look bad to the rest of the world. Separating children from families is obviously bad--unless the alternatives are worse (including leaving a child with an adult who is not their parent--and who may be abusive). The border policy predates Trump (but with zero public crying and outrage back in the days of hope and change); and American criminals sent to jail have their children separated from them all the time without tearful politicians and TV hosts expressing outrage. And let me add that I find it hilarious that Democrats claim the president is creating a dictatorship. Yet on the border issue Democrats didn't want Congress to change the law on child separation for illegal border crossers that Trump enforces. No, Democrats wanted Trump to use his pen--as Senator Schumer stated--to simply change his policy in defiance of statutes. Fascinating. Can the Army carry out its core competency of large-scale conventional warfare? Yes, the weight of armored vehicles is trending in a bad direction. But how much passive (but heavy) armor can be eliminated in favor of active defenses or avoiding detection? I'm just a bit skeptical that we have real alternatives to passive armor. Remember, active protection systems are needed on our Abrams not to replace lots of heavy passive armor but to protect against hits to thinner side, rear, and top armor. I think the only way around this weight of armor problem is eventually to get remotely operated or robotic vehicles (so no crew to protect) that don't bother with much armor above protection from auto cannons and shrapnel, are considered semi-disposable, and are made in large numbers. Infantry carriers might become the only heavy vehicles left because of their precious human cargo. Wow! Socialism in Venezuela made everyone millionaires! Feel the Bern! Twitterfied America really is depressing in the hate and intolerance it amplifies. I keep telling myself that the vast majority of people aren't like the vile examples of our species that Twitter attracts. I really am an optimist, eh? Saudi Arabia's MBS is in a dangerous game to transform Saudi Arabia from a "tribal petrostate to a mature, 21st-century nation." Qatar is not bending to Saudi pressure and is pulling Iran and Turkey into the region to balance the Saudis, however; and the possible need to go nuclear if Iran manages to do that will make the transformational game more dangerous. There can be no doubt that Saudi Arabia needs American help in a dangerous neighborhood. We should hope Mohammed bin Salman succeeds in his dangerous game. But what are the odds their predictions will be amazingly wrong for another thirty years? The China-India border dispute. I did not know that China has managed to gain control of 1,000 square kilometers of land since 2000. Assad finds using chemical weapons to be an efficient method of killing people who support rebels, figuring that if you grab them by the balls, their hearts and minds will follow. As I noted before, Assad killed his way to victory. It isn't quite accurate to compare this to the American "hearts and minds" approach to counter-insurgency because Assad doesn't face an insurgency--he faces a civil war where enemies control parts of Syria that Assad cannot enter. This is more like Saddam using chemical weapons against fanatical Iranian troops along the front in the Iran-Iraq War. This is why civilian casualties are relatively small in the multi-war (I think no more than 30% of the estimated 500,000 dead). Also, I don't think the non-Western world with experience on the western front of World War I have the same horrific view of chemical weapons. So that's a factor in use. How it is a shock that illegal immigration harms poor Americans disproportionately is beyond my ability to comprehend. Mind you, it is great for liberal Americans in the upper class who can validate their moral superiority by championing open borders and have cheap lawn care services. Tip to Instapundit. If Republicans argued with Democrats the way Democrats attack Republicans, when you note that Democrats love trains to nowhere, Republicans would say that Nazis used trains to take victims to death camps--so commuter trains are just like Nazi trains. Which means Democrats are just like Nazis. Seriously, not everybody you hate is a Nazi. And I'll add, why do you hate everyone who disagrees with you? I thought it was significant that the FBI has found no evidence of Russian-Trump election collusion, but the FBI counter-intelligence capability seems to have deteriorated dangerously in general, so maybe not. I mean seriously, WTF? Last week my data dump had more non-defense things than I like. I'm working on it. Although I consider border security a national security issue. And I resent the way Democrats distort the issue for political gain to make America look bad to the world. If America was really so bad, people wouldn't be flocking here in droves. And really, why haven't all those in Hollywood who pledged to flee abroad actually left? Speaking of border issues, Canada doesn't like how we treat Central American refugees crossing our border. Of course, those refugees should apply for refuge in Mexico rather than continuing north to America. Funny enough, without hostile press coverage or public outrage, since last summer Canadian officials have been telling Haitians, Mexicans, and Central Americans in America that they shouldn't head for Canada. Canada has been approving just 8% of such refugee claims, sending the rest back to their country of origin. Said the Canadians, "Canadians are broadly supportive of immigration. But Canadians truly believe in order and well-managed immigration." Same here. China's economy rests on a fragile foundation. I'm really not happy that Turkey will get F-35s. I hope that the plane is a reduced-capability version of the new plane America and the West will rely on for air superiority for decades to come. I guess the problem isn't that the Russians will crawl over the plane, but that the plane will exchange lots of data with Turkey's air defense system that will be provided by Russia--which Russian technicians will crawl all over. Can we throttle the data flow, at least? We're smart enough to do that, right? The wonders of capitalism for bringing goods within the reach of everybody. And oh yeah, it took the British press to reveal that the Time magazine "crying child" cover had never been separated from her parent. But remember, "fake news" that promotes a liberal agenda isn't a thing. And yes, children have been separated from jailed parents. But if there are so many apples out there, why show a banana? I mean, if the media cares about credibility. The headline says "EU"-American defense ties will be fine, according to the NATO chief. But the article is really about European-American defense ties. Thank God the European Union does not mean geographic Europe. America has friends in Europe. But an institutional Europe defined as the EU will not long be America's friend. Wow, will Sweden really manage to sell their Gripen fighter to the Philippines? I guess India will get a base in the Seychelles. Why is is so hard for some people on the left to understand that you can be in favor of immigration while being opposed to illegal immigration across a porous border? The two are different things! Of course, I still don't understand why some people on the left can't understand that you can lack any hatred of Moslems while being in favor of killing murderous jihadi bastards. Those are also different categories of people. The first unit of American B-1 bombers will get the long-range AGM-158C anti-ship missile. Their most likely war-time deployment would be to Guam in the Pacific or Diego Garcia in the Indian Ocean. Or to Iceland or Italy, I suppose, if the Russians insist on being a more pressing potential foe than China. Iran is equipping its old F-4 Phantoms for the long-range naval strike mission. Even an old plane with modern anti-ship missiles can be a potent threat. So there is another reason why our carriers just should not enter the Persian Gulf. Seriously, when everything Trump does is like the Nazis, according to the media; and so anyone who supports Trump is therefore just like Nazis, Trump supporters just stop giving a damn that you think they are just like Nazis. You can't be the media who cried Nazi and expect the lack of actual Nazi policies (I honestly don't think the people making that claim have any understanding at all of actual Nazis) to allow you to keep making that claim without losing credibility. At some point, people say, "You keep using that word. I do not think it means what you think it means." The people throwing the Nazi charge around are historically ignorant and despicable, hateful people. Period. The Philippines is pushing to upgrade its antiquated military. They can hardly defeat China in a war in defense of Filipino territory in the South China Sea that China is taking. But Manila can make sure it is capable of winning a battle with Peking over one of those small pieces of territory--and hope the alliance with America and Japan deters China from escalating to a war China would win if it was just a Philippines-China clash. I'm just not that worried that Trump will agree to a bad deal with North Korea for the sake of having a deal. I trust Secretary of Defense Mattis, National Security Adivsor Bolton, and Secretary of State Pompeo not to go along with that, even if Trump wants to. And I trust the Senate not to go along with pretending any agreement isn't a treaty requiring a 2/3 Senate vote. Republicans have said that; and if the Democrats grab the Senate, you know they won't do anything but insist the agreement is a treaty. Remember, one of the reasons I supported the Obama "strategic patience" of doing nothing on North Korea was that I didn't trust they wouldn't agree to a bad deal if they talked to North Korea. The Syria chemical weapons deal and Iran nuclear deal were bad enough without adding North Korea as the hat trick deal. So I was happy for no contact. I thought the basic bet on strategic patience was reasonable: that North Korea would collapse before they went nuclear. My complaint with Obama's bet that North Korea would collapse before going nuclear is that the administration didn't end the policy when it became clear that North Korea would beat that bet and go nuclear first. My memory of the long Iraq War debate that extended from 2002 to about 2007 was that military options were only good if the WMD threat is "imminent." Yet Obama missed that Golden moment of consensus, somehow. Heck, I worried that Bush 43 might make a bad deal to deflect Democratic anger over Iraq. I have no idea if Trump can get a good deal with Kim Jong-Un. History argues against it. But I'm willing to see if Trump can do it, and I'm not panicking about a bad deal. Not yet, anyway. U.S. intelligence agencies believe North Korea has increased production of fuel for nuclear weapons at multiple secret sites in recent months and may try to hide these while seeking concessions in nuclear talks with the United States, NBC News quoted U.S. officials as saying. We have work to do before ruling out war to destroy Kim's nuclear program. And regarding the Korean Peninsula situation, our diplomats are firmly in the lead, and aligned with the agreement signed by President Trump and Chairman Kim at their summit earlier this month. As our diplomats work to bring this agreement to fruition, the U.S. military, in close coordination with our allies and partners, continues its clear-eyed approach, supporting international sanctions and multiple unanimous U.N. Security Council resolutions. For now. Mattis isn't the sort who neglects being able to kill everyone in the room, if necessary. It's hard for me to express my contempt for Russia's so-called fear. Mongols? Total active armed forces: 10,000. Poles? Total active armed forces: 100,000. Swedes? Total active armed forces: 20,000. French? Total active armed forces: 239,000. Germans? Total active armed forces: 251,000. None of them are capable of invading Russia, whose total active forces are nearly a million strong. Get over it, Russia. Times change. And really, what are the limits of Russia's advance west if you accept their need to dominate nations that border them because of that deep sense of vulnerability? Yet the one country that might gain the capability to invade Russia--China with its 2.3 million active forces--continues to rise and loom over Russia's Far East that China lost to Russia in the 19th century. Yet Russia appeases them while provoking the West. Which makes sense if you think about it. I've mocked the pretense of the resistance that pretends it is bravely resisting a dictatorship when they in fact face no threat at all from the Trump administration. I seriously didn't think they could keep up the frantic pace of initial insanity, but I was wrong as it is now clear that "11" is the lowest setting on their dial. I'd forgotten that I'd mocked this exact same attitude during the Bush 43 administration. You've heard the claims before--the Bushtatorship has suppressed dissent and critics have experienced a chilling effect that silences them. No, really, stop giggling. Some war critics truly believe that the truth only gets out because some Baldwin brother manages to smuggle crudely reproduced tracts from Michael Moore from one organic market to the next in unnamed body orifices as part of a network of safe houses to inform the devoted few who resist the fascist state that suppresses all dissent. Good grief man, one day they might look up your library records! Maybe! Perhaps! Can't rule it out! Seriously, those of you on the Left crying--again--that Hitler has been reborn, should be embarrassed by your current descent--again, but deeper--into Paranoiaville. The only actual black-clad street thugs out there are the anarchists and communists of the "antifa" movement on your side. How are you people screeching about mythical Nazis any different from the "Michigan Militia" "black helicopter" types who thought Bill Clinton was preparing to turn America over to the UN and establish concentration camps? How are you any different from the "birthers" who believed Barack Obama was a secret Moslem who wasn't even born in America, out to ... well, I'm not actually sure what the ultimate step of that paranoia was. It isn't that hard to oppose a president without descending into madness. I did it. You just never found that kind of unhinged and ultimately laughable thinking here. Indeed, President Obama was the first (and thus far only) president whose tenure fell fully within my blog's existence (since July 12, 2002). So I had every chance to develop and display the insanity that is gripping the resistance. You really can oppose policies without demonizing your political opponent--who is not the enemy. Hitler made Jews wear Stars of David on their clothing to identify them for discrimination, persecution, and ultimately extermination. You sport "resistance" logos on your backpacks, hats, purses, and cars secure in the knowledge that you will sleep through the night with no knocks on the door to cart you off. See how different that is? Your feelings of being oppressed have no basis in reality. Just stop it. Because at this point, we're starting to not care about your descent into madness. Oh, and in the spirit of compromise, I propose that for every American who believes this rot and who agrees to exile (to whatever glorious country that will accept them), America should accept one entire refugee family from Central America. This is hardly shocking. We already knew that nothing could outrage "no drama" Obama until Hillary Clinton lost the 2016 election. And then "blood and guts" Obama was off to the races looking for Russkies under every bed--a single-minded focus picked up by most of the American media-entertainment complex. Sadly, too many in that slice of American society seem willing to ask, regarding jihadis who slam planes full of our people into our buildings, "why do they hate us?" as if America did something to justify that violence; while wondering why so many people who don't go to Ivy League schools and who don't live in coastal cities "hate" so much. I've never learned to hate liberals. I've lived with and worked with too many to see them as less than people and more as caricatures. They are mostly nice people--even if I disagree with their politics about how to run America or approach the world. They aren't evil for having different views. Yes, I'll complain about "liberals" or "the Left" on occasion. For the latter I'm generally talking about the far left near- and actual socialists, anarchists, and communists. For the former I'm actually speaking shorthand for the vocal and published liberals with outrageous views who I know don't reflect the vast majority of liberals in the intensity of the feelings or the intolerance of opposing views, at least. On the policy aspect, most may agree with the outrageous voices without also hating those who disagree. To varying degrees, of course, depending on the issue. It may not always be clear when I write that shorthand, but it is true. And I do try to remember that most of the people who bitterly attack "the right," conservatives, or Republicans are using shorthand, too, and don't really believe that people who want immigration laws enforced are alt-Righters with Nazi/Klan/Confederate uniforms in their closets. But Twitter and social media amplify such voices and are possibly the most destructive feature of our age. Tolerance and getting along would be a lot easier if the federal government was smaller with a restricted scope of authority that didn't motivate huge efforts to control the federal government. UPDATE: People need to get a grip and stop treating politics like a religion requiring the smiting of enemies. Although in one sense it is a logical result of giving our federal government so much power. I don't think everyone views chemical weapons the way we do. The current global—and Congressional—debate about whether to deploy force against Syria for its use of sarin gas on civilians will depend, in part, on whether the reasons for a post-World War I agreement banning the offensive use of chemical and biological weapons continue to be honored. The 1925 Geneva Protocol did not focus on World War I's terrible new 20th-century technologies that made 19th-century military tactics obsolete and led to mass slaughter: advancements in barbed wire, machine guns, and artillery led to incomprehensible and horrible effects on combatants. It was the impact of gas use on both the Western and Eastern fronts that led to the prohibition on chemical and biological warfare, even though it had led to only about one percent of the deaths there. The protocol viewed gas warfare as different from the other methods of mass killing, and banned the use of "asphyxiating, poisonous or other gases" as well as "bacteriological methods." But the "global" prohibition is purely the result of Western nations with that view of chemical weapons dominating the global system. The rest of the world doesn't share the view because they did not experience the trauma of World War I that would have been horrible even without poison gas. It is quite possible that chemical weapons are the "scapegoat" for the bloody, stalemated horrors of the western front in World War I, where chemical weapons were actually a minor factor in the death toll. In theory, we think that the threat of nuclear weapons is a deterrent to enemy chemical weapons use. But is that true if the opponent doesn't share the thinking of the West on chemical weapons use? Would an enemy use chemical weapons on our troops, not believing it is anywhere near the same level as nuclear weapons? Would we actually use nukes--and remember that we continue to destroy our chemical weapons as we agreed to eliminate--if our forces are hit with chemical weapons? Or do we need to think about whether states that don't share the Western revulsion over chemical weapons will use them on us if they get the chance? And where does Russia fit on that issue? In the Cold War, we certainly feared they would liberally use gas if they attacked NATO. I sure practiced suiting up a lot in my limited time in uniform. The major takeaway of this election is that Erdogan is now in possession of extremely expanded presidential powers. During his time in office, he has engineered constitutional amendments to give him one of the most powerful presidencies in modern Turkish history. And though in theory there are still some internal checks on his power, in practice little can be done to block his agenda and that of his ruling Justice and Development Party (AKP). Among other things, Erdogan now has the power to rule by decree, appoint Cabinet members, write Turkey's budget and appoint judges — all without parliamentary approval. In contrast to the belief of people here who claim Trump is building a dictatorship one Tweet at a time (yes, their beliefs are idiotic), Erdogan actually achieved that scope of power. So what does NATO do? Democracy and rule of law were required to join NATO after the Cold War. Will loss of democracy and rule of law be a trigger for expulsion? I'd say quietly reducing intelligence and contingency plan information would be prudent. "Green" Europe steps up to fight global warming! The European Union’s (EU) “go diesel” initiative of the mid-1990s is a perfect example [of the folly of government planning of the economy]. After years of negotiation, most countries (with the exception of the United States) signed the Kyoto protocol in 1997, which pledged the industrialized world to binding reductions of greenhouse gases. To meet their pledged twenty percent reduction in emissions, EU environmental planners pushed car manufacturers to invest heavily in fuel-saving diesel technology. But mass markets would subsequently reject diesel-powered cars. Contrary to the planners’ expectations, the diesel initiative did not lower automobile-fuel use or reduce greenhouse gases. Rather, it blanketed cities with air pollution, destroyed the value of used diesels, set back Europe’s car manufacturers in the international competition for a clean and fuel-efficient car, and created a powerful pro-diesel lobby that continues to exercise influence on regulators and bureaucrats throughout the European Union. But for them, it was always better to look good on the environment than to be good on the environment. Many officers are desperate and often ask (among themselves) how their leaders could treat the defenders of the nation so badly. No wonder Kim Jong Un is so worried about his military. He cannot threaten his angry soldiers with nuclear weapons and he cannot risk a widespread “purge” of “subversive elements” because so many troops qualify as “subversive” because of their attitudes and desperate situation. Put more simply the military force Kim Jong Un fears most is his own, not the Chinese, American or South Koreans. [If] the regime in Pyongyang is demoting the army, even if it is unable to take on the South Korean and American armies, it will still be strong enough to fight the regime secret police. Downgrading the army will likely set in a spiral of mistrust and resentment on the part of the North Korean leaders and the army. The North Korean army might begin to identify more with the oppressed people who along with them will be stuck with the lowest priority in resources. Could North Korea really afford to abandon what is a large slave labor force that has young men with military training? Better to have a foe inside the tent peeing out than outside the tent peeing in, as the expression goes. 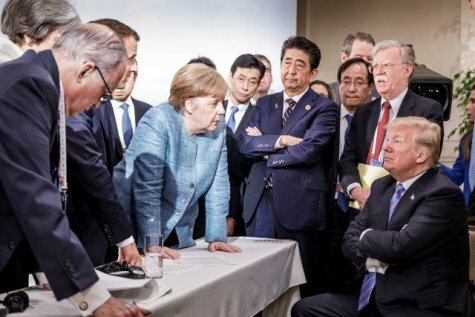 The summit meeting seems to have ruled that option out, at least. Improving the economy to resist the Chinese seems more important to Kim, and he even looked at authoritarian Singapore's economy while he was there to meet with Trump. I did mention the appeal of meeting in Singapore for that reason. But as I've mentioned, progress on getting a de-nuclearization deal has to be rapid enough to out-pace North Korean progress in getting nukes. North Korea could stretch the time to get a deal with real interim concessions, but can we verify that kind of gesture with enough certainty? I really have no idea if this diplomatic track can succeed. It does seem like it might, however, under today's circumstances. When assessing the United States, United Kingdom, Canada, and New Zealand future land concepts, a common thread started emerging—information. The volume, scale, accessibility, contestability, and weaponization of information are all factors in the future of conflict. Another theme also emerged, which is the lethality of future conflict. Since a flood of information has to be analyzed by computers to make it useful to a commander, options for an enemy to hack your information flow could cripple your forces. And technology will make the ability to target enemies without attacking civilians much easier. The authors even mention the possibility of targeting enemies by their DNA--for example when an enemy occupies a city, assuming they have different DNA signatures. Of course, given odd things we've learned about multiple DNAs residing within a person, could an occupying army be "immunized" against such a DNA-targeted weapon? Anyway, it is interesting to ponder the future of war. Here's the last entry in my mini-series on reviewing predictions of war. Mass in the form of imprecise autonomous weapons could see deployable “boxes of missiles.” Essentially a box can be dropped in an area, be digitally camouflaged to its surroundings, and lay dormant until triggered. Once triggered, it can deploy multiple rockets or missiles onto a target providing mass of firepower to delay or destroy an enemy. Imagine these scattered across an area to defend borders, or to deter movement within an area of operations. In the future, separating missiles from the FCS makes the most sense for a networked force. Missile modules, each containing two or more missiles, could be dropped off in the wake of the advancing FCS unit or even scattered by aircraft along the axis of advance in the enemy’s rear areas. The FCS crew could control firing. On the other hand, the weapons of 1953 and 1991 were once the leading edge rather than being the old forms. What is really scary is what might happen when the next first-echelon force is the old form of warfare we have to fall back on when that era's first-echelon force is depleted. "Iran's aggressive tendencies must not only be discussed, but rather we need solutions urgently," she said after meeting Jordan's King Abdullah in Amman. She announced 384 million euros ($445 million) of aid to Jordan this year. Merkel said on Thursday that while European countries wanted to maintain the 2015 accord, they shared concerns over Iran's ballistic missile program, its presence in Syria and its role in the war in Yemen. The 2015 Iran nuclear deal was intended to stop Iran from being a nuclear missile threat and turn Iran into a responsible regional power. Merkel is worried about Iran's missiles and aggression, but still somehow thinks the nuclear part is still something to be hoped for. Just when I think I'm starting to get a grasp of that whole European nuance gift, they throw me a curve ball and demonstrate that I just don't grok it. «The Northern Fleet has embarked on the largest gathering in 10 years,» reads the brief information from Russia’s Northern Fleet Wednesday afternoon. A total of 36 warships and support vessels are currently on their way out to the Barents Sea. Also, about 20 aircrafts are in the air. Along the coast of the Kola Peninsula, more than 150 different rocket- and artillery weapon systems and special equipment are deployed. The exercises ended less than a week ago and no doubt were intended to intimidate Norway. The Norwegians want more American Marines to remain in their country--and closer to Russia--just in case. The Russians proceeded to wet themselves at the prospect of a whole 700 Marines anywhere near Russia. Which pretty much guaranteed the renewal of the Norwegian TV series Occupied. Seriously, somebody in Russia needs to tell Putin he's effing things up royally. The system weighs only 32 grams, and can fly at speeds up to 21 kilometers per hour for up to 2 kilometers, he said. Soldiers are “looking for a covert, safe and immediately available situational awareness tool” that they can carry easily and use at the squad level, Aguirre said. “It’s so small that the enemy probably won’t see it and you’ll see the enemy before they see you,” he added. This UAV is tiny and very expensive. It’s popularity springs from the fact that the Black Hornet provides stealthy reconnaissance of the enemy in the minutes or seconds you go on the attack. No other UAV has been able to provide that kind of information and for that reason troops (and police) who regularly face dangerous and unpredictable situation see Black Hornet as a long wished for life saver. So now a squad has its own air corps. How long before this is semi-disposable and launched from tubes--like smoke grenades--mounted on the outside of armored vehicles, too? The Strategypage post does note that it is very valuable for armored vehicles in forests or urban areas and can be launched from inside the vehicle (I assume from an open hatch). Seriously, the Air Force needs to move away from the battlefield and just give the Army the mission and resources--from A-10 Warthogs to Black Hornet drones--to operate over the battlefield, and instead become the United States Aerospace Force. But we won't get what I want--we'll get a Space Force, if Congress goes along. Drug production continues to fuel the Taliban by generating money and the need for drug gangs to pay the Taliban for protection to produce and export the drugs from Afghanistan. Where will the drug gangs go? One side effect of the increased fighting in Helmand Province has been the frequent attacks on the improvised facilities where opium is turned into heroin. Most of these labs are in Helmand and usually in urban areas where it is easier to move the lab supplies in and the heroin out. But the Taliban leader for Helmand has convinced the drug gangs to move their drug labs to rural areas in order to avoid air strikes as well as lower civilian casualties from these attacks. An unmentioned reason for this order is that the labs are unpopular because they are a source of opium and heroin (often stolen) for local addicts. More addicts make the Taliban more unpopular and make it easier for the government to obtain information on lab locations from locals. Does this explain the recent Taliban assault that reportedly included 2,800 Taliban moved from other places in Afghanistan for the operation? Does this mean the Taliban and drug gangs are going to move drug production to western Afghanistan for export routes through Iran and western Pakistan? And keep in mind that Iran has reason to punish the West for the American withdrawal from the highly flawed Iran nuclear deal. And Pakistan has reason to push the trade west away from Pakistan to avoid Western ire in the east over the issue. It indeed appears as if Iran is backing the Taliban in western Afghanistan where Taliban from all around Afghanistan massed 2,800 fighters in the failed attempt to take Farah. But the reports of how bad the government's position there are confusing given that the Taliban assault on Farah did actually fail. And the Taliban did apparently have to draw in forces far from Farah. I admit I'm worried. I just don't know if I have a reason to worry. I didn't think that it was a coincidence that the attack was near Iran (see updates). It is odd that the Taliban would approve a short ceasefire during their "spring offensive" in the "fighting season," isn't it? I don't trust a three-day ceasefire in Afghanistan. Could the Taliban just be repositioning troops for another try to take Farah? Could it be to help their fighters massed for the prior failed attack scatter back to their points of origin? Or something not related to Farah, of course. Protecting new drug production and distribution routes in the west near Farah would make sense. But these are flimsy dots I'm connecting, I freely admit. See? Trump can't get along with out allies! Crisis! Doom! Halliburton! * Resistance! That is what we are supposed to believe was the tenor of the G-7 meeting in Canada. Obviously there is a gap in time since the Japanese delegation has moved out of the frame. But if the media had emphasized this picture as the symbol of the meeting, everyone could enjoy the allied solidarity, no? Just feel the good vibe! Heck, you could even take the absence of the Japanese delegation as the cause of the change from serious to jovial. Maybe the Japanese Abe is a wet blanket. 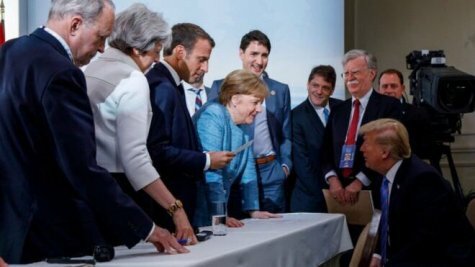 Maybe the rest of the G-7 was having a laugh at Abe's expense after he left? Who knows? Maybe the second picture is actually earlier, and Abe's new presence lightened the mood. Heck, maybe in the first picture was taken while the allies discussed Russian occupation of Ukrainian territory. Or the upcoming nuclear talks. Or the American League designated hitter rule. Who knows? But with the second picture, surely the message isn't that the meeting was a long glare-fest of anger. Unless you select the picture to convey that and run with the message that it is a symbol of anti-Trump unity. Italy summoned France's envoy and angrily rejected French criticism of its immigration policies on Wednesday, escalating a diplomatic standoff between the neighboring European powers. But the media wants you to think that disputes are unique to Trump. I won't quite say that the media shouldn't be trusted. But do be aware of the Gell-Mann Amnesia effect. *Perhaps the memory has faded of our Left screeching Halliburton! like some odd religious incantation during the Iraq War. Honestly, when I think about it, the unhinged liberal rage at Vice President Cheney back then was just the warm up for Trump Hysteria Condition. Where are the Legions Headed? Italy has been a valued partner in military missions abroad. Will that change with a new populist government? Will Italy cut defense spending and the overseas record they've compiled in the post-Cold War world? Italy has more troops on foreign deployment than any other European country except the UK. Indeed, from having been solely focused on territorial defence during the Cold War, the Italian armed forces have undergone a remarkable transformation and now make a crucial contribution to regional security. Sure, the US has more than 60,000 troops permanently based in Europe – but among European NATO member states, Italy’s contribution looms large. According to statistics from the International Institute for Strategic Studies, a London-based think tank, Italy currently has 5,000 troops on foreign deployment – far more than Germany (around 3,800) or Spain (around 1,700). Some 600 Italian soldiers are serving as part of the NATO peacekeeping mission in Kosovo, along with some 900 with Resolute Support Afghanistan. Nearly 300 Italian sailors (along with two ships and two aircraft) are part of NATO’s Sea Guardian mission in the Mediterranean; another 500 or so are deployed in Niger. Until May, the Italian Air Force helped protect the Baltic states’ air space as part of NATO’s Baltic Air Policing. Italy has even dispatched 162 soldiers, along with 50 vehicles, to Latvia as part of NATO’s Enhanced Forward Presence mission, aimed at deterring Russian aggression in the Baltics. They haven't committed to fighting missions, it is true. But their participation has been valuable. Or is the worry based on the vague sense of doom that any non-centrist party (of the left or right variety) inspires in the status quo proponents? Also, it is funny that in Europe a populist government is seen as likely to cut defense spending; while here the defense budget is considered important to prioritize American interests. Hezbollah and Iran say they won't leave Syria until all of Syria is under Assad's authority, according to a friend of those two who is the speaker of Lebanon's parliament. Given that Syria's Golan Heights is controlled by Israel, that's a rather open-ended pledge. I've noted that Ukraine gave up a lot of former Soviet nukes only to find Russia disregarded the paper security agreement that was supposed to replace a nuclear deterrent. I've probably even mentioned South Africa giving up their nuclear capabilities. But I generally forget that Khazakstan and Belarus, too, gave up their nukes inherited from the Soviet Union. So where is Erdogan taking Turkey and will the Turks go along? Denmark is adding a new NATO-funded radar to their Baltic Sea Bornholm Island, which will be useful for monitoring Russian military activity in the sea. Which the British-organized Joint Expeditionary Force of regional forces-including non-NATO Sweden and Finland--would find useful. America indicated support for Georgia's aspiration to join NATO in light of it being targeted by Russia in 2008 (and a creeping border shift since then). I'm all in favor of helping Georgia defend itself and arm itself to the teeth to resist a Russian invasion, but I'm not so sure it should be in NATO given its isolated position. Unless Turkey is a solid NATO ally, how can NATO protect Georgia with anything other than nukes fired at Moscow? Let's see how Turkey goes first, eh? The only patriarchy that American feminists won't fight. Ever. A Norwegian anti-ship missile was selected for use on the LCS to give it over-the-horizon (to over 100 nautical miles) capabilities. The ship designed to be a flexible vessel in an era of low anti-ship threats needs to be up-gunned to deal with actual naval threats. Canada is a good ally. We were allies when our respective tariffs have been tilted against America. And we will be good allies if Trump's in-your-face negotiating style tilts the comparison more equal to America. (Although I would like to see a comparison of our respective tariff levels to demonstrate whether Trump's complaints have merit.) That said, I still regret President Trump's treatment of Trudeau--one-man Canadian boy band that he is (hey, I'm not affiliated with the US government)--at the G-7 meeting in Canada. And while the delegation of authority to the president by Congress to levy tariffs is lawful, I don't like using a national security reason to restrict Canadian imports to put pressure on Canada, regardless of the balance of tariffs. But I do trust that the objective is lower tariffs rather than a trade war. A little less panic and a little more calm, please. Say, remember when America "declared war" on "the whole Canadian economy?" I know. That's way different. Because Tweets. Ten paradoxes of our age. "I’ve got some bad news for you, Sunshine: You aren’t fighting the Establishment. You are the Establishment." This is old, but you want to read it. Ah, new-found respect! No worries. If he actually runs for president again, according to the media he'll again be a Nazi with binders full of dead dogs, or something. Okay, I laughed pretty hard at this. Background. This is real. For a while some time back I found I was having difficulty sticking with reading a book, so used to online shorter pieces had I gotten. So I forced myself to sit and read and I restored that capacity. So yeah, if people are just used to reading Tweets, that's gonna leave a mark. Huh, Britain suspended sending fighter aircraft to their NATO ally Iceland since 2008 because Iceland owed Britain money. I thought economic hardball with allies was unprecedented and lacking in nuance. Anyway, Britain is resuming deployments after getting paid. And let's not even get started on the Cod Wars. Just go and sign to make PAINCOM a reality! Both Japan and South Korea have amphibious warfare ships that could be adapted to be small aircraft carriers if equipped with F-35Bs. It's good that North Korea will send the remains of dead American soldiers from the Korean War back to us, but hanging on to such remains to trade them to America is standard operating procedure for North Korea's odious regime. Assume they have many more. The American military could cheaply 3-D print spare parts--but a law would need to be passed to sideline the lawyers. The ten most important Russian-Turkish wars. I'm not overly worried that Russia and Turkey can be allies. Although the lack of a common border in the east and the lack of a clear path to Turkey through the Balkans does reduce the option for a serious 11th war, so I can't rule out a change to ally status, at least for a short period of time--that could last years or decades. The FBI Dies in Darkness. Pity reporters didn't cover that. Honestly, I fear the worst but hope the reality is far better than it seems. Although it is true that Clinton's "setting up of a private, non-secure server system for all official business" is the smoking gun of criminal intent. The Chinese "long plan" to economic and military dominance. I find it amusing that the plan is to match what America did by coming out of nowhere to industrialize and become a global superpower--when so many say America can't think beyond the next quarterly report. Spoiler alert: Did you check in the intern's mouth? Last week, an American air strike in Libya, 100 miles southeast of Tripoli, killed a terrorist affiliated with al Qaeda. Remember them? The job of killing those scum continues. What gets me about the June 2016 tarmac meeting between Bill Clinton and Attorney General Loretta Lynch is that no reporter has ever asked the right question. Given that we know that Bill "It depends on what the meaning of the word 'is' is" Clinton can lie with definitions, this remains shocking to me. And the Inspector General report on the email server issue continues this failure by saying that they "found no evidence" of an "inappropriate discussion" [my emphasis] about the Hillary email scandal. Bill said that they never talked about that issue and instead chatted about grandchildren and whatnot. Yeah, that's why he went out of his way to that airport where Lynch just happened to be. I can actually believe they talked about just what they said they talked about. But why hasn't any reporter asked if they exchanged information about the issue? Why didn't the IG explore that? Tell me you don't think Clinton and Lynch could have chatted about family while handing written communications regarding the email scandal back and forth--notes that would have been taken by Clinton from the plane and quickly burned and churned. And tell me that you don't think Bill Clinton could have looked everybody in the eye and said "I did not have verbal communications with that woman, Ms. Lynch." Once again we are exposed to the fact that education is separate from intelligence. Smells like woke spirit. Somebody needs to be figuratively struck with the figurative clue bat. Because it isn't "anti-intellectualism" to have contempt for much of the uniformly leftist professor class that hasn't used tenure to think apart from the herd. Seriously, if the professor class doesn't rein in their idiots, a lot of good professors will be collateral damage when the reaction against the idiots sets in at the state legislature level. America and South Korea will not hold the annual August military exercises--as long as North Korea is making progress on de-nuclearization talks. I did note that we should see progress by those exercises. I assume we will continue to plan for the exercise in case North Korea does not display progress. Democrats are harming America's standing in the world by wrongly claiming kids are being put in camps likened to Nazi concentration camps. If America is so bad, word hasn't filtered out to the people who continue to flood across the border. It's a tough problem compounded by changing migrant practice in response to our laws, and it should be out of bounds--to anybody with a functioning brain stem, a bit of historical knowledge, and the common sense God gave mossy rocks--to charge America is anything at all like Nazi Germany in trying to cope. They should be ashamed to make the charge. But they won't be. Honestly, this just seems like an organized political ploy rather than any spontaneous outrage. The Stanford Prison Experiment was faked. It was performance art more than anything, it seems. Yet this will be believed for decades more, I'm sure. Social science! The Greek government says it has turned the corner on controlling its debt. The crisis was apparent eight years ago, and I worried that Greece might be vulnerable to being "flipped" by Russia or--more likely--China in exchange for financial aid. Thankfully I worried for nothing. I don't understand how this author can say American intervention in Iraq in 2003 and Libya in 2011 justify North Korea's desire for nuclear weapons when North Korea's pursuit of nuclear weapons predates those interventions by a long time. The Syrian government is now targeting the rebels in the southwest. Those "de-escalation" zone agreements for ceasefires were always about getting rebels further down the Assad priority list to remain passive while Syria and their allies went after other rebels. But the rebels in the southwest patiently waited for their turn, and here it is, complete with Russian air support for Assad. And Assad tells the northern rebels they are next. Turkey backs them. Truly this was an amazingly inept rebellion more interested in fighting each other than fighting Assad. And now the US told those formerly CIA-backed "southern front" rebels that they are on their own. Our efforts were pretty lame, too, when you recall that Assad was on the ropes in 2012. Even Russian intervention in 2015 could have been overcome. But no, America struck a king without killing him. South Korea should not welcome Russian help with de-nuclearizing North Korea. Russia "helped" with the 2013 Syria chemical weapons deal and with the 2015 Iran nuclear deal. Are we really to believe the third time will be good? Iraqi security forces clashed with Iran-backed militias in Baghdad. These militias arose after the Iraqi military in northern Iraq collapsed in mid-2014 to defend the country. The Iraqi military collapsed because loyalty to the state was elevated above competence for officer selection. That happened because America prematurely left in 2011 and so did not provide a safety net for Iraqi leaders against coups; and were not present to keep the military leadership competent. Iraq needs our help to bring these militias under full control and to disband those that can't be brought under control. I'm glad to see some progress in fighting corruption in Romania. Rule of law is needed to make that NATO country a truly reliable and effective partner. The Seychelles parliament denied India basing rights. Well that's unfortunate. But perhaps it is just a bidding war with China. The battle for the port of Hodeidah in the Yemen civil war continues. The Saudi-led coalition needs to take it to stop Iranian arms smuggling to rebels and needs to take it functional to keep foreign humanitarian aid flowing. There is pressure for the coalition to stop the offensive. Why isn't there pressure on the rebels to retreat from the port without destroying the facilities? The US Air Force’s (USAF) KC-46A Pegasus military aerial refuelling aircraft is set to begin its flight tests from Edwards Air Force Base (AFB) to demonstrate its capability as a receiver aircraft. KC-46A Pegasus will be based at Edwards AFB through this month as the aircraft manufacturer Boeing and USAF’s 418th Flight Test Squadron will carry out tests with the new tanker. We are far from everyplace but friendly Canada and Mexico. So we need to move planes long distances to get to the fights. Which means we need refueling planes that aren't falling apart in flight. Time Enough to Hope--and to Kill? Algeria is in bad shape. The brutal jihadi uprising in the 1990s that "immunized" Algeria against the current jihadi surge in the wider Arab world is getting smaller in the rear view mirror every day. The government is using a combination of violent censorship (lots of journalists arrested and jailed or expelled if foreigners), deficit spending, taking good care of the security forces, discouraging luxury imports and foreign travel to keep an increasingly unhappy population calm. The government also benefits from [a] fractious and uninspiring political opposition that could win national power if they had recognizable leader of a united coalition. So unemployment remains over 10 percent and growing (thanks to more young workers who cannot find jobs), corruption continues to discourage initiative, entrepreneurs or innovation and oil revenue continues to decline. The half century of oil income allowed the development of a corrupt political elite that brutally suppressed a decade long Islamic terrorist uprising in the 1990s and uses popular aversion to use another uprising to change the government. But as time goes on memories of the 1990s violence fade and armed insurrection becomes more appealing to a growing population of unemployed. Algeria is another national uprising waiting to happen. The spillover into Tunisia, Libya, Niger, Mali, and Europe could be very ugly if Algeria descends into violence again. And am I wrong to assume Morocco would ride out that kind of storm? Could Erdogan lose his snap election? President Recep Tayyip Erdogan's main rival in Sunday's polls on Friday challenged the Turkish strongman in a mass rally in the capital Ankara, inviting him for a television debate as a "last chance." Muharrem Ince may only be able to force a runoff on July 8, which Erdogan may then win by hook or crook. But it is worth it to try to stop Erdogan in this last chance to stop him from being an emperor in all but name. At least Erdogan may have to admit that Turkey didn't gladly hand Turkey to one man. And maybe that act of defiance will keep the flames of democracy and rule of law alive in Turkey. UPDATE: Erdogan won outright. Strategypage has more on this disturbing development. Can you imagine Russia's military reputation if they had stopped after seizing Crimea with nearly no bloodshed? In June 2018, the Russo-Ukraine War has become an expensive example of violent stagnation. The expenses are measured in lives lost and money wasted, spilled blood and red ink. Both sides suffer, and Ukraine demonstrably since the fighting occurs on its territory. However, Russian president Vladimir Putin and the curious oligarchy of billionaires and gangsters backing his Kremlin regime have discovered the expensive stalemate has exacerbated Russian economic problems. Widespread disappointment has revived demands for internal change, which is bad news for Putin and his cronies. In retrospect, Putin's Kremlin bet on two things: rapid military and political victory in Ukraine and high oil prices constantly replenishing Russia's national coffers. Just because the threat of invasion is "largely bluff" doesn't mean Russia could not invade Ukraine. But it would be ugly and lack "style points" that are required when a major power uses force against a minor power. Especially given Ukraine's unready military, I think Russia could bulldoze their way into eastern Ukraine over Ukrainian opposition. But it would be ugly and expose Russian weaknesses. Russia doesn't want that. And if Ukrainians resist such an invasion of eastern Ukraine, Russia could face a long front line against Ukrainian troops that attempt to whittle away Russian control while partisans resist in areas of Russian control. Although obviously, Ukrainians can rightly want to avoid a war even if they believe that ultimately they will eject the Russians. I think Russia really doesn't want to attempt more than Crimea. That's at the limit of their real power, I believe. And even that could look ugly if the Ukrainians resist in their besieged bases and if Ukraine can use (even if it burns up) their small air force and navy to exact a price and deny Russia easy style points. I was speaking of a broader invasion than only the Donbas. But this judgment has proven true in the smaller objective of the Donbas region of Ukraine. Of course, Russia did invade eastern Ukraine--although I was right that a broader invasion was not likely to succeed as even the failure in the smaller objective shows. But I was right that the Russians shouldn't want to invade more of Ukraine after the Crimea takeover. Ah, the Western faith in "science!" "We had a terrible measles outbreak in Minnesota last year," Hotez noted, adding that vaccination coverage in 90% to 95% of all children is needed to protect against highly infectious diseases. It is worse in Europe, apparently. How sophisticated. I once read that you could use the location of Whole Food Markets as a good proxy for where immunizations lag in America. But by all means, wage war hammer and tong against plastic straws rather than get your children immunized. The UK-led Joint Expeditionary Force (JEF), which draws on a pool of high readiness forces from nine partner nations across Europe, carried out a final validation exercise, dubbed 'Joint Warrior', between 20 April and 5 May as the force moves closer to a full operating capability later this year. In a demonstration of readiness, air and land components of the formation, which included elements of the Danish Jutland Dragoon Regiment, Lithuanian Iron Wolf Brigade, Latvian Mechanised Infantry Brigade, and UK 3rd Battalion The Parachute Regiment, mounted a series of ‘joint validation’ tasks at the fighting in built-up area training village on Salisbury Plain in the southern UK. The member of JEF are Britain, Latvia, Lithuania, Estonia, Norway, Netherlands, Denmark, Finland, and Sweden. This will be useful to fight for the islands of the Baltic Sea, I imagine, should the Russians get more active than they should. Socialist Venezuela's decline is accelerating now. I almost used "tragedy" instead of "stupidity" in the headline, but this collapse is the totally predictable result of deliberate decisions to impose socialist idiocy on a once-prosperous country. But there is a silver lining. There is no way a reasonable person (I stand corrected) can blame this coming collapse on America because the heart of the now-rapidly accelerating collapse occurred during the Obama administration. And who, pray tell, will argue that the left-wing Obama administration worked to undermine the socialist paradise that our Left told us that Hugo Chavez established and left to his idiot successor Maduro? UPDATE: The people who don't realize how good socialism is just need to be killed, I guess. I hear the omelet will be delicious! This research is most meaningful for China, which now has the second largest GDP in the world. There are enough verifiable statistics (especially when it comes to foreign trade and international banking activity) to verify that China now has a huge, and probably second only to the United States, economy. But accurate data on annual GDP growth is crucial in determining the health of the Chinese economy and what vulnerabilities it has. The Chinese government was forced to admit that the decades of 10 percent a year GDP growth were over and appears to have settled on 6-7 percent a year being the acceptable new normal. But foreign analysts see five percent or (and eventually) less as the reality and a catastrophic economic collapse (because of mismanagement of the banking system) still a possibility. China has achieved real growth and has lifted a lot of people from dire poverty. But most have not benefited from this growth (and fixing the lagging status of interior provinces is one major reason for the One Belt One Road "New Silk Road" project). But that massive growth was really done by the means that the Soviet Union used to achieve its early massive economic growth that so impressed gullible Western fanboys (and girls)--China moved peasants into low-tech factories. And as I've noted many times, when you put the most efficient peasant into even the most inefficient factory (or construction site for that infrastructure), you get a massive increase in GDP. But that method of achieving growth is pretty much over as other states start to pick up the low-wage manufacturing role, even taking some from China. China is in a better position than the Soviet Union was to move up the quality and tech scale for added value in their economy; but has farther to go given the massive size of the still-very poor part of the Chinese population. I wouldn't rule out that "China" will ultimately be a geographic rather than a political term. The Chinese civilization is ancient. But unified political rule of all that territory and all those people hasn't been continuous.